On Friday I picked up my free breakfast meal from Subway and brought it the office. 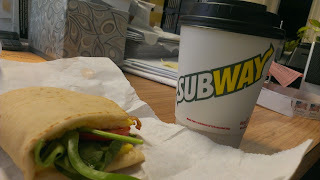 I got the bacon, egg, and cheese on flat bread adding spinach, red pepper and tomato; it came with a free small coffee. Normally the combo is $3, which is a pretty good deal in my book, but today it was free because I reserved my free breakfast with their promotion. My breakfast experience: I thought the flat bread sandwich was tasty and healthy, especially once I added some veggies. I appreciated the Subway coffee to-go-cup because it wasn't styrofoam and it didn't use a sleeve. Sleeved coffee is just the darnedest thing to fit in a car cup holder. I just hate it. Instead the coffee cup was made of a thicker cardboard that was well insulated, fitting very conveniently in my vehicle - so props on that. What I don't like about the Subway breakfast is the wait in line. Call me antsy, but I'm normally in a rush, especially at breakfast. It's difficult for me to have enough time to get out of my car, and tell the person what I'd like in my meal, grab my own coffee and then hop back in my car. If it's a morning before work, I will pretty much never have time to go through this process unless it's my day off, but that's just my personality.But despite my my constant state of rush and tardiness, this $3 combo is a still good deal.